← Day 81: Sick of Tissue? I don’t have much experience in parades apart from a brief stint as a girl guide, but this weekend, Grant and I participated in our first ever Recycling Parade! A friend of mine, Miss M, lives in an amazing building called Quayside Village. They recycle and reuse so much at Quayside that they don’t even have a garbage dumpster. They are an entire apartment building living virtually waste free! How is this possible with so many people? We were invited to come and tour their recycling facilities, and, lucky for us, it happened to be the day of the great Recycling Parade. You see, it’s not that Quayside residents necessarily consume much less than the average person, they just recycle all their packaging, and that means an extensive sorting area. I counted no less than 20 different bins for sorting recyclables in their parkade – from low grade paper and plastic to batteries and wood. As you can imagine, a lot of the stuff isn’t curbside pickup, so they have to take it to the depot themselves. When we arrived, recycling had been piling up, abit sorted, for about 6 months. They can either drive it over town and drop it for free or pay a fee at the once-a-month mobile depot that is conveniently only two blocks away. Quayside resident Recycling Guru, Brian, surmised that the best way to get all the bags down to the depot was of course to organize a parade complete with whistles and drums. So that’s what they did. 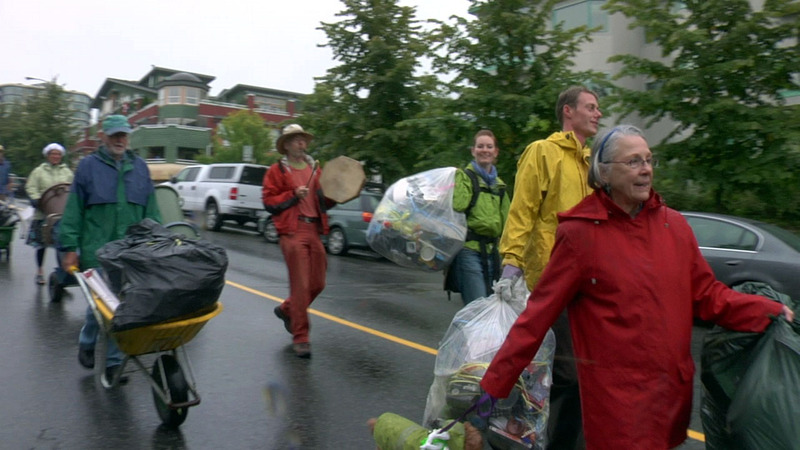 Residents from the 19 units – adults, children, and dogs alike – gathered together and carried, wheeled, and dragged their recycling down to the depot in a colourful entourage that took over half the roadway and drew more than a few stares. Despite the gray weather, we were met with much fanfare as the candidate of the Green Party of Canada was also at the depot soliciting support for his campaign and helping people unload their cars. 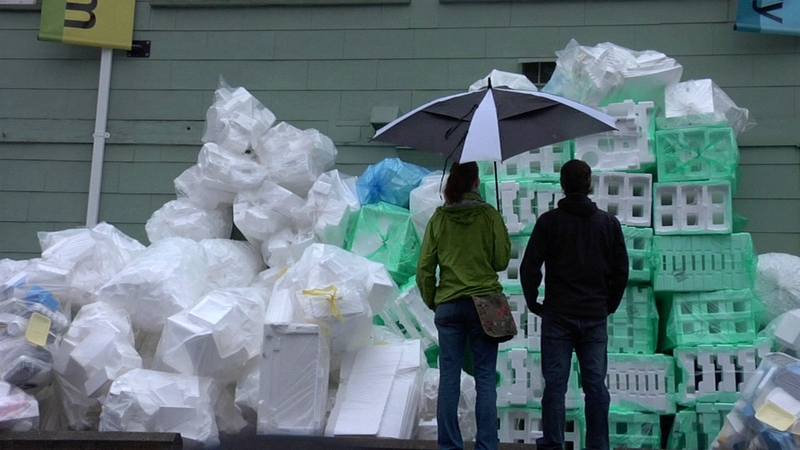 A 10 foot high wall of styrofoam was already stacked against on one side of the parking lot, and volunteers were scrambling to dump mixed bags into kiddie pools and manually sort the different types of plastic into bins. Contrary to what I have read elsewhere, at this depot, all hard plastics went together regardless of number. For a small donation, they took soft plastic, hard plastic, styrofoam, tetrapacks, chip bags, electronics and even toothbrushes, most of which gets recycled here in BC (the styrofoam goes to the States). In the end we got so wrapped up with the parade and the nearby opening of the new library that we didn’t get a proper tour of the Quayside recycling center, so I guess we’ll have to go back. But what we did get was a great sense of community from the residents of Quayside and a lot of inspiration to continue our project. Plus, I confirmed that we can indeed recycle those un-numbered plastic lids from bottles and soy milk containers as well as plastic corks. Two more items out of the “I’m not sure” bin! We also had a great interview with Brian (but I won’t go into details because it will all be in the film we’re making – stay tuned). Many thanks to the residents of Quayside for letting us participate. If you live in the Vancouver area, the mobile depot is at the Presentation House Theatre in North Van every third Sat of the month so hold onto your styrofoam meat trays and your old toothbrushes! I have recycling envy! I have spent the better part of this morning desperately trying to find somewhere in the Province of Alberta to take soft plastics… so far, I have run into nothing but ‘dead ends’. One man say that they would take them by the ‘dump truck load’ and my friend runs her own waste management company for us country-folk, so I am going to see if I can’t put something together with her.